"Green power" redirects here. For other uses, see Green power (disambiguation). Sustainable energy technologies are deployed to generate electricity, to heat and cool buildings, and to power transportation systems and machines. When referring to methods of producing energy, the term "sustainable energy" is often used interchangeably with the term "renewable energy". In general, renewable energy sources such as solar energy, wind energy, geothermal energy, and tidal energy, are widely considered to be sustainable energy sources. However, implementation of particular renewable energy projects, such as the damming of rivers to generate hydroelectricity or the clearing of forests for production of biofuels, sometimes raises significant sustainability concerns. There is considerable controversy over whether nuclear energy can be considered sustainable. Costs of sustainable energy sources have decreased immensely throughout the years, and continue to fall. Increasingly, effective government policies support investor confidence and these markets are expanding. Considerable progress is being made in the energy transition from fossil fuels to ecologically sustainable systems, to the point where many studies support 100% renewable energy. The concept of sustainable development was described by the World Commission on Environment and Development in its 1987 book Our Common Future. Its definition of "sustainability", now used widely, was, "Sustainable development should meet the needs of the present without compromising the ability of future generations to meet their own needs." In its book, the Commission described four key elements of sustainability with respect to energy: the ability to increase the supply of energy to meet growing human needs, energy efficiency and conservation, public health and safety, and "protection of the biosphere and prevention of more localized forms of pollution." Various definitions of sustainable energy have been offered since then which are also based on the three pillars of sustainable development, namely environment, economy, and society. Environmental criteria include greenhouse gas emissions, impact on biodiversity, and the production of hazardous waste and toxic emissions. Economic criteria include the cost of energy, whether energy is delivered to users with high reliability, and effects on jobs associated with energy production. Socio-cultural criteria include the prevention of wars over the energy supply (energy security) and long-term availability of energy. As no source of energy meets these criteria perfectly, sustainable energy sources are sustainable only in comparison to other sources. The nonexistence of perfect energy sources means that promoting efficient use of energy is essential to sustainable energy strategies. Green energy is energy that can be extracted, generated, and/or consumed without any significant negative impact to the environment. The planet has a natural capability to recover which means pollution that does not go beyond that capability can still be termed green. It represents those renewable energy resources and technologies that provide the highest environmental benefit. The U.S. Environmental Protection Agency defines green power as electricity produced from solar, wind, geothermal, biogas, biomass and low-impact small hydroelectric sources. When referring to sources of energy, the terms "sustainable energy" and "renewable energy" are often used interchangeably, however particular renewable energy projects sometimes raise significant sustainability concerns. Renewable energy technologies are essential contributors to sustainable energy as they generally contribute to world energy security, reducing dependence on fossil fuel resources, and providing opportunities for mitigating greenhouse gases. Various Cost–benefit analysis work by a disparate array of specialists and agencies have been conducted to determine the cheapest and quickest paths to decarbonizing the energy supply of the world, with the topic being one of considerable controversy, particularly on the role of nuclear energy. Hydroelectric dams are one of the most widely deployed sources of sustainable energy. One of many power plants at The Geysers, a geothermal power field in northern California, with a total output of over 750 MW. Geothermal energy can be harnessed to for electricity generation and for heating. Technologies in use include dry steam power stations, flash steam power stations and binary cycle power stations. As of 2010, geothermal electricity generation is used in 24 countries, while geothermal heating is in use in 70 countries. International markets grew at an average annual rate of 5 percent over the three years to 2015, and global geothermal power capacity is expected to reach 14.5–17.6 GW by 2020. Geothermal power is considered to be a sustainable, renewable source of energy because the heat extraction is small compared with the Earth's heat content. The greenhouse gas emissions of geothermal electric stations are on average 45 grams of carbon dioxide per kilowatt-hour of electricity, or less than 5 percent of that of conventional coal-fired plants. As a source of renewable energy for both power and heating, geothermal has the potential to meet 3-5% of global demand by 2050. With economic incentives, it is estimated that by 2100 it will be possible to meet 10% of global demand. Biomass is biological material derived from living, or recently living organisms. As an energy source, biomass can either be burned to produce heat and to generate electricity, or converted to various forms of biofuel. Liquid biofuels such as biodiesel and ethanol are especially valued as energy sources for motor vehicles. Biomass is extremely versatile and one of the most-used sources of renewable energy. It is available in many countries, which makes it attractive for reducing dependence on imported fossil fuels. If the production of biomass is well-managed, carbon emissions can be significantly offset by the absorption of carbon dioxide by the plants during their lifespans. If the biomass source is agricultural or municipal waste, burning it or converting it into biogas also provides a way to dispose of this waste. As of 2012, wood remains the largest biomass energy source today. If biomass is harvested from crops, such as tree plantations, the cultivation of these crops can displace natural ecosystems, degrade soils, and consume water resources and synthetic fertilizers. In some cases, these impacts can actually result in higher overall carbon emissions compared to using petroleum-based fuels. Use of farmland for growing fuel can result in less land being available for growing food. Since photosynthesis is inherently inefficient, and crops also require significant amounts of energy to harvest, dry, and transport, the amount of energy produced per unit of land area is very small, in the range of 0.25 W/m2 to 1.2 W/m2. In the United States, corn-based ethanol has replaced less than 10% of motor gasoline use since 2011, but has consumed around 40% of the annual corn harvest in the country. In Europe in the 19th century, there were about 200,000 windmills, slightly more than the modern wind turbines of the 21st century. They were mainly used to grind grain and to pump water. The age of coal powered steam engines replaced this early use of wind power. Wind power has high potential and have already realised relatively low production costs. At the end of 2008, worldwide wind farm capacity was 120,791 megawatts (MW), representing an increase of 28.8 percent during the year, and wind power produced some 1.3% of global electricity consumption. Wind power accounts for approximately 20% of electricity use in Denmark, 9% in Spain, and 7% in Germany. However, it may be difficult to site wind turbines in some areas for aesthetic or environmental reasons, and it may be difficult to integrate wind power into electricity grids in some cases. Solar heating systems generally consist of solar thermal collectors, a fluid system to move the heat from the collector to its point of usage, and a reservoir or tank for heat storage and subsequent use. The systems may be used to heat domestic hot water, swimming pool water, or for space heating. The heat can also be used for industrial applications or as an energy input for other uses such as cooling equipment. In many climates, a solar heating system can provide a very high percentage (20 to 80%) of domestic hot water energy. Energy received from the sun by the earth is that of electromagnetic radiation. Light ranges of visible, infrared, ultraviolet, x-rays, and radio waves received by the earth through solar energy. The highest power of radiation comes from visible light. Solar power is complicated due to changes in seasons and from day to night. Cloud cover can also add to complications of solar energy, and not all radiation from the sun reaches earth because it is absorbed and dispersed due to clouds and gases within the earth's atmospheres. Solar thermal power stations have been successfully operating in California commercially since the late 1980s, including the largest solar power plant of any kind, the 350 MW Solar Energy Generating Systems. Nevada Solar One is another 64MW plant which has recently opened. Other parabolic trough power plants being proposed are two 50 MW plants in Spain, and a 100 MW plant in Israel. Solar electricity production uses photovoltaic (PV) cells to convert light into electrical current. Photovoltaic modules can be integrated into buildings or used in photovoltaic power stations connected to the electrical grid. They are especially useful for providing electricity to remote areas. 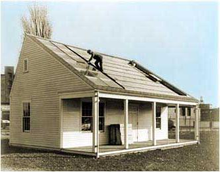 MIT's Solar House#1 built in 1939 used seasonal thermal energy storage (STES) for year-round heating. The world's first commercial tidal stream generator – SeaGen – in Strangford Lough. The strong wake shows the power in the tidal current. Portugal has the world's first commercial wave farm, the Aguçadora Wave Park, under construction in 2007. The farm will initially use three Pelamis P-750 machines generating 2.25 MW. and costs are put at 8.5 million euro. Subject to successful operation, a further 70 million euro is likely to be invested before 2009 on a further 28 machines to generate 525 MW. Funding for a wave farm in Scotland was announced in February, 2007 by the Scottish Executive, at a cost of over 4 million pounds, as part of a £13 million funding packages for ocean power in Scotland. The farm will be the world's largest with a capacity of 3 MW generated by four Pelamis machines. (see also Wave farm). In 2007, the world's first turbine to create commercial amounts of energy using tidal power was installed in the narrows of Strangford Lough in Northern Ireland, UK. The 1.2 MW underwater tidal electricity generator takes advantage of the fast tidal flow in the lough which can be up to 4m/s. Although the generator is powerful enough to power up to a thousand homes, the turbine has a minimal environmental impact, as it is almost entirely submerged, and the rotors turn slowly enough that they pose no danger to wildlife. There is considerable controversy over whether nuclear power can be considered sustainable. Some forms of nuclear power (ones which are able to "burn" nuclear waste through a process known as nuclear transmutation, such as an Integral Fast Reactor, could belong in the "Green Energy" category). Renewable energy (and energy efficiency) are no longer niche sectors that are promoted only by governments and environmentalists. The increased levels of investment and the fact that much of the capital is coming from more conventional financial actors suggest that sustainable energy options are now becoming mainstream. Investment flows in 2007 broadened and diversified, making the overall picture one of greater breadth and depth of sustainable energy use. The mainstream capital markets are "now fully receptive to sustainable energy companies, supported by a surge in funds destined for clean energy investment". In developing countries, an estimated 3 billion people rely on traditional cookstoves and open fires to burn biomass or coal for heating and cooking. This practice causes harmful local air pollution and increases danger from fires, resulting in an estimated 4.3 million deaths annually. Additionally, serious local environmental damage, including desertification, can be caused by excessive harvesting of wood and other combustible material. Promoting usage of cleaner fuels and more efficient technologies for cooking is therefore one of the top priorities of the United Nations Sustainable Energy for All initiative. Thus far, efforts to design cookstoves that are inexpensive, powered by sustainable energy sources, and acceptable to users have been mostly disappointing. A solar trough array is an example of green energy. Green energy includes natural energetic processes that can be harnessed with little pollution. Green power is electricity generated from renewable energy sources. Some definitions may also include power derived from the incineration of waste. Some have argued that although green energy is a commendable effort in solving the world's increasing energy consumption, it must be accompanied by a cultural change that encourages the decrease of the world's appetite for energy. In several countries with common carrier arrangements, electricity retailing arrangements make it possible for consumers to purchase green electricity (renewable electricity) from either their utility or a green power provider. In some countries such as the Netherlands, electricity companies guarantee to buy an equal amount of 'green power' as is being used by their green power customers. The Dutch government exempts green power from pollution taxes, which means green power is hardly any more expensive than other power. Directive 2004/8/EC of the European Parliament and of the Council of 11 February 2004 on the promotion of cogeneration based on a useful heat demand in the internal energy market includes the article 5 (Guarantee of origin of electricity from high-efficiency cogeneration). European environmental NGOs have launched an ecolabel for green power. The ecolabel is called EKOenergy. It sets criteria for sustainability, additionality, consumer information and tracking. Only part of electricity produced by renewables fulfills the EKOenergy criteria. A Green Energy Supply Certification Scheme was launched in the United Kingdom in February 2010. This implements guidelines from the Energy Regulator, Ofgem, and sets requirements on transparency, the matching of sales by renewable energy supplies, and additionality. The United States Department of Energy (DOE), the Environmental Protection Agency (EPA), and the Center for Resource Solutions (CRS) recognizes the voluntary purchase of electricity from renewable energy sources (also called renewable electricity or green electricity) as green power. The most popular way to purchase renewable energy as revealed by NREL data is through purchasing Renewable Energy Certificates (RECs). According to a Natural Marketing Institute (NMI) survey 55 percent of American consumers want companies to increase their use of renewable energy. Scientific production towards sustainable energy systems is rising exponentially, growing from about 500 English journal papers only about renewable energy in 1992 to almost 9,000 papers in 2011. Currently, photovoltaic (PV) panels only have the ability to convert around 24% of the sunlight that hits them into electricity. At this rate, solar energy still holds many challenges for widespread implementation, but steady progress has been made in reducing manufacturing cost and increasing photovoltaic efficiency. Both Sandia National Laboratories and the National Renewable Energy Laboratory (NREL), have heavily funded solar research programs. The NREL solar program has a budget of around $75 million  and develops research projects in the areas of photovoltaic (PV) technology, solar thermal energy, and solar radiation. The budget for Sandia’s solar division is unknown, however it accounts for a significant percentage of the laboratory’s $2.4 billion budget. Several academic programs have focused on solar research in recent years. The Solar Energy Research Center (SERC) at University of North Carolina (UNC) has the sole purpose of developing cost effective solar technology. In 2008, researchers at Massachusetts Institute of Technology (MIT) developed a method to store solar energy by using it to produce hydrogen fuel from water. Such research is targeted at addressing the obstacle that solar development faces of storing energy for use during nighttime hours when the sun is not shining. In February 2012, North Carolina-based Semprius Inc., a solar development company backed by German corporation Siemens, announced that they had developed the world’s most efficient solar panel. The company claims that the prototype converts 33.9% of the sunlight that hits it to electricity, more than double the previous high-end conversion rate. Major projects on artificial photosynthesis or solar fuels are also under way in many developed nations. Space-Based Solar Power Satellites seek to overcome the problems of storage and provide civilization-scale power that is clean, constant, and global. Japan and China have active national programs aimed at commercial scale Space-Based Solar Power (SBSP), and both nation's hope to orbit demonstrations in the 2030s. Bangui Wind Farm in the Philippines. There are many large wind farms under construction and these include BARD Offshore 1 (400 MW), Clyde Wind Farm (350 MW), Greater Gabbard wind farm (500 MW), Lincs Wind Farm (270 MW), London Array (1000 MW), Lower Snake River Wind Project (343 MW), Macarthur Wind Farm (420 MW), Shepherds Flat Wind Farm (845 MW), and Sheringham Shoal (317 MW). Wind power has expanded quickly, its share of worldwide electricity usage at the end of 2014 was 3.1%. Over $1 billion of federal money has been spent on the research and development of hydrogen and a medium for energy storage in the United States. (2012) Both the National Renewable Energy Laboratory and Sandia National Laboratories have departments dedicated to hydrogen research. Hydrogen is useful for energy storage, and for use in airplanes and ships, but is not practical for automobile use, as it is not very efficient, compared to using a battery — for the same cost a person can travel three times as far using a battery electric vehicle. Regardless of that opinion, Japanese car manufacturers Toyota and Honda currently offer hydrogen fuel-cell powered passenger vehicles for sale in Japan and the U.S.A. Experimental hydrogen fuel-cell city buses are currently operative in two U.S. transit districts, Alameda/Contra Costa county, California, and in Connecticut.. See List of fuel cell vehicles. Also, in the European Union there is a clear trend of promoting policies encouraging investments and financing for sustainable energy in terms of energy efficiency, innovation in energy exploitation and development of renewable resources, with increased consideration of environmental aspects and sustainability. Edenhofer, Ottmar (2014). Climate Change 2014: Mitigation of Climate Change : Working Group III contribution to the Fifth Assessment Report of the Intergovernmental Panel on Climate Change. New York, NY: Cambridge University Press. ISBN 978-1-107-05821-7. OCLC 892580682. Kutscher, C.F. ; Milford, J.B.; Kreith, F. (2018). Principles of Sustainable Energy Systems, Third Edition. Mechanical and Aerospace Engineering Series. CRC Press. ISBN 978-0-429-93916-7. Retrieved 10 February 2019. Smil, Vaclav (2017). Energy Transitions: Global and National Perspectives. Santa Barbara, California: Praeger, an imprint of ABC-CLIO, LLC. ISBN 978-1-4408-5324-1. OCLC 955778608. Tester, Jefferson (2012). Sustainable Energy : Choosing Among Options. Cambridge, MA: MIT Press. ISBN 978-0-262-01747-3. OCLC 892554374. ^ a b c Kutscher, Milford & Kreith 2018. ^ Renewable Energy & Efficiency Partnership (August 2004). "Glossary of terms in sustainable energy regulation" (PDF). Retrieved 19 December 2008. ^ James, Paul; Magee, Liam; Scerri, Andy; Steger, Manfred B. (2015). Urban Sustainability in Theory and Practice. London: Routledge. ; Liam Magee; Andy Scerri; Paul James; Jaes A. Thom; Lin Padgham; Sarah Hickmott; Hepu Deng; Felicity Cahill (2013). "Reframing social sustainability reporting: Towards an engaged approach". Environment, Development and Sustainability. Springer. ^ World Commission on Environment and Development (1987). "Chapter 7: Energy: Choices for Environment and Development". Our Common Future: Report of the World Commission on Environment and Development. Oxford New York: Oxford University Press. ISBN 978-0-19-282080-8. OCLC 15489268. ^ a b c d Prandecki, Konrad (25 May 2014). "Theoretical Aspects of Sustainable Energy". Energy and Environmental Engineering. 2 (4): 83–90. doi:10.13189/eee.2014.020401 (inactive 16 March 2019). Retrieved 24 February 2019. ^ "Green Power Defined | Green Power Partnership | US EPA". Epa.gov. 28 June 2006. Retrieved 8 July 2010. ^ "THE NET BENEFITS OF LOW AND NO-CARBON ELECTRICITY TECHNOLOGIES. MAY 2014, Charles Frank PDF" (PDF). ^ "Comparing the Costs of Intermittent and Dispatchable Electricity-Generating Technologies", by Paul Joskow, Massachusetts Institute of Technology, September 2011". ^ Loftus, Peter J.; Cohen, Armond M.; Long, Jane C. S.; Jenkins, Jesse D. (2015). "A critical review of global decarbonization scenarios: what do they tell us about feasibility?". Wiley Interdisciplinary Reviews: Climate Change. 6: 93–112. doi:10.1002/wcc.324. ^ Hydroelectric power's dirty secret revealed New Scientist, 24 February 2005. ^ Ferris, David (3 November 2011). "The Power of the Dammed: How Small Hydro Could Rescue America's Dumb Dams". Retrieved 4 January 2012. ^ Geothermal Energy Association. Geothermal Energy: International Market Update May 2010, p. 4-6. ^ a b Garretson, Peter (Spring 2012). "Solar Power in Space?" (PDF). Strategic Studies Quarterly. Retrieved 21 May 2015. ^  Retrieved on 12 April 2012. ^ a b c Smil 2017, p. 162. ^ Smil 2017, p. 161. ^ "Wind powered factories: history (and future) of industrial windmills". LOW-TECH MAGAZINE. ^ "Global Wind Report Annual Market Update". Gwec.net. Retrieved 21 August 2013. ^ "Wind energy gathers steam, US biggest market: survey". 2 February 2009. Retrieved 8 July 2010. 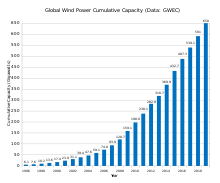 ^ "Global wind energy markets continue to boom – 2006 another record year". Retrieved 30 January 2015. ^ "Solar assisted air-conditioning of buildings". Archived from the original on 5 November 2012. Retrieved 5 November 2012. ^ "Israeli company drives the largest solar plant in the world". Isracast.com. 13 March 2005. Retrieved 8 July 2010. ^ Collings AF and Critchley C. Artificial Photosynthesis- from Basic Biology to Industrial Application. WWiley-VCH. Weinheim (2005) p xi. ^ "MIT creates first Solar Leaf". geek.com. 30 September 2011. ^ "Concepts for new sustainable energy technologies". Pitb.de. Retrieved 21 August 2013. ^ "National Space Society|Working to Create a Spacefaring Civilization". Nss.org. Retrieved 28 October 2018. ^ Ricardo David Lopes (1 July 2010). "Primeiro parque mundial de ondas na Póvoa de Varzim". Jn.sapo.pt. Retrieved 8 July 2010. ^ "Turbine Technology Turning The Tides Into Power". ^ "SeaGen Turbine Installation Completed". 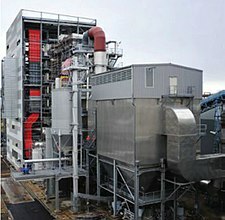 Renewableenergyworld.com. Retrieved 8 July 2010. ^ Moore, Patrick (16 April 2006). "Going Nuclear". The Washington Post. Retrieved 8 January 2013. ^ "Greenpeace International: The Founders (March 2007)". Archived from the original on 3 February 2007. Retrieved 21 August 2013. ^ "Co-Founder of Greenpeace Envisions a Nuclear Future". Wired News. Retrieved 8 January 2013. ^ Monbiot, George (20 February 2009). "George Monbiot: A kneejerk rejection of nuclear power is not an option | Environment". London: theguardian.com. Retrieved 21 August 2013. ^ "Has Bill Gates come up with a safe, clean way to harness nuclear power?". The Independent. Retrieved 9 January 2013. ^ "End the nuclear age | Greenpeace International". Greenpeace.org. Retrieved 8 July 2010. ^ "The Case Against Nuclear Power - Greenpeace International" (PDF). Archived from the original (PDF) on 24 September 2015. ^ InterAcademy Council (2007). Lighting the way: Toward a sustainable energy future p. xvii. ^ Huesemann, Michael H., and Joyce A. Huesemann (2011). Technofix: Why Technology Won’t Save Us or the Environment, Chapter 5, "In Search of Solutions: Efficiency Improvements", New Society Publishers, ISBN 978-0-86571-704-6. ^ American Council for an Energy-Efficient Economy (2007). The Twin Pillars of Sustainable Energy: Synergies between Energy Efficiency and Renewable Energy Technology and Policy Report E074. ^ a b Global Trends in Sustainable Energy Investment 2008 Archived 8 September 2008 at the Wayback Machine p. 8. ^ a b "Smart Grid | Department of Energy". Energy.gov. Retrieved 21 August 2013. ^ a b "These cheap, clean stoves were supposed to save millions of lives. What happened?". Washington Post. 29 October 2015. Retrieved 1 March 2019. ^ "Climate Change as a Cultural and Behavioral Issue: Addressing Barriers and Implementing Solutions" (PDF). ScienceDirect. 2010. Retrieved 28 August 2013. ^ San Francisco Community Choice Program Design, Draft Implementation Plan and H Bond Action Plan, Ordinance 447-07, 2007. ^ "The European ecolabel for electricity". EKOenergy. Retrieved 21 August 2013. ^ "Center for Resource Solutions". Center for Resource Solutions. ^ a b "Insights into the Voluntary Renewable Energy Market". Renewable Energy World. Retrieved 8 July 2010. ^ "Health & Wellness Consumer Market Research. Strategic Consulting". Nmisolutions.com. Retrieved 8 July 2010. ^ "Green Power Partnership". EPA.gov. Archived from the original on 22 April 2014. ^ "Green Power Partnership | US EPA". Epa.gov. 28 June 2006. Retrieved 8 July 2010. ^ U.S. Department of Energy Office of Electricity Delivery and Energy Reliability. ^ S.C.E. Jupe; A. Michiorri; P.C. Taylor (2007). "Increasing the energy yield of generation from new and sustainable energy sources". Sustainable Energy. 14 (2): 37–62. ^ "Defense-scale supercomputing comes to sustainable energy research". Sandia National Laboratories. Retrieved 16 April 2012. ^ Rizzi; et al. (2014). "The production of scientific knowledge on renewable energies: Worldwide trends, dynamics and challenges and implications for management. In". Renewable Energy. 62: 657–671. doi:10.1016/j.renene.2013.08.030. 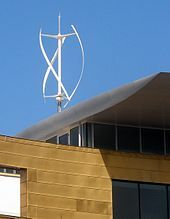 ^ National Renewable Energy Laboratory (2 March 2007). "Research Advantages: Cellulosic Ethanol" (PDF). National Renewable Energy Laboratory. Archived from the original (PDF) on 25 January 2012. Retrieved 2 April 2012. ^ Charles E. Wyman (2007). "What is (and is not) vital to advancing cellulosic ethanol". Trends in Biotechnology. 25 (4): 153–157. doi:10.1016/j.tibtech.2007.02.009. PMID 17320227. ^ Smil, Vaclav. "Electricity From Wind." Energy Myths and Realities: Bringing Science to the Energy Policy Debate. Washington, D.C.: AEI, 2010. 101. Print. ^ Sandia National Laboratories. "Biomass". Sandia National Laboratories. Archived from the original on 10 May 2012. Retrieved 17 April 2012. ^ Joint BioEnergy Initiative. "About JBEI". Sandia National Laboratories. Retrieved 1 February 2015. ^ "How Algae Biodiesel Works". 18 June 2008. ^ "Valcent Products Inc. Develops "Clean Green" Vertical Bio-Reactor". Retrieved 9 July 2008. ^ Armaroli, Nicola; Balzani, Vincenzo (2011). "Towards an electricity-powered world. In". Energy and Environmental Science. 4 (9): 3193–3222. doi:10.1039/c1ee01249e. ^ a b Robert Hargraves; Ralph Moir (January 2011). "Liquid Fuel Nuclear Reactors". American Physical Society Forum on Physics & Society. Retrieved 31 May 2012. ^ "Th-ING: A Sustainable Energy Source | National Security Science Magazine | Los Alamos National Laboratory". lanl.gov. 2015. Retrieved 1 March 2015. 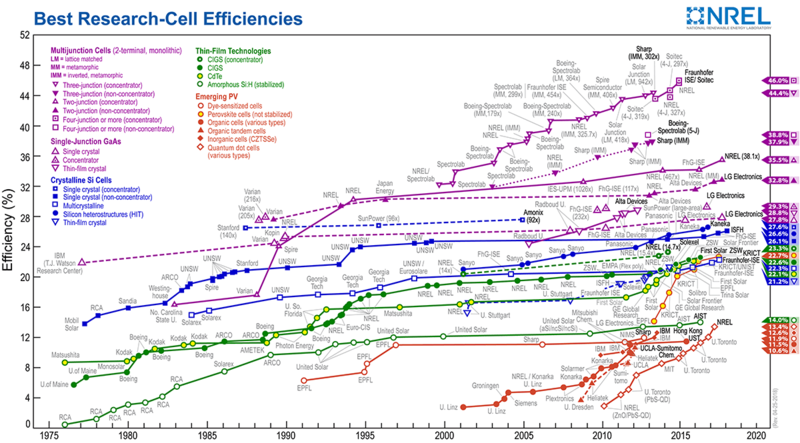 ^ "NREL Photovoltaic Efficiency Chart". NREL. Retrieved 19 April 2017. ^ Chakrabarty, Gargi (16 April 2009). "Stimulus leaves NREL in cold". Denver Post. Retrieved 16 April 2012. ^ "Solar Research". NREL. Retrieved 16 April 2012. ^ "Photovoltaics". Sandia. Retrieved 16 April 2012. ^ "'Major discovery' from MIT primed to unleash solar revolution". MIT News. Retrieved 17 April 2012. ^ "Breakthrough: World's most efficient solar panel". SmartPlanet. Retrieved 17 April 2012. ^ "Wind energy research reaps rewards". NASA. Retrieved 17 April 2012. ^ "Wind energy". Sandia. Retrieved 17 April 2012. ^ "Wind research". NREL. Retrieved 17 April 2012. ^ "Wind resource evaluation at the Caltech Field Laboratory for Optimized Wind Energy (FLOWE)" (PDF). Caltech. Archived from the original (PDF) on 16 December 2011. Retrieved 17 April 2012. ^ Smil, Vaclav. "Electricity From Wind." Energy Myths and Realities: Bringing Science to the Energy Policy Debate. Washington, D.C.: AEI, 2010. 120-21. Print. ^ Smil, Vaclav. "Electricity from Wind." Energy Myths and Realities: Bringing Science to the Energy Policy Debate. Washington, D.C.: AEI, 2010. 115-30. Print. ^ a b László, Erika (1981). "Geothermal Energy: An Old Ally". Ambio. 10 (5): 248–249. JSTOR 4312703. ^ a b Dorfman, Myron H. (July 1976). "Water Required to Develop Geothermal Energy". Journal (American Water Works Association). 68 (7): 370–375. doi:10.1002/j.1551-8833.1976.tb02435.x. JSTOR 41268497. ^ L. Ryback (2007). "Geothermal Sustainability". GHC Bulletin: 2–6. ^ NREL. "Geothermal Technologies". NREL. Retrieved 17 April 2012. ^ Sandia. "Geothermal". Sandia. Retrieved 17 April 2012. ^ Deutsches GeoForschungsZentrum (GFZ) Helmholtz Center Potsdam. "International Centre for Geothermal Research". GFZ Helmholtz Center Potsdam. Retrieved 17 April 2012. ^ Jeff Wise. "The Truth about hydrogen what is hydrogen". Popular Mechanics. Retrieved 17 April 2012. ^ NREL. "Hydrogen". NREL. Retrieved 17 April 2012. ^ Sandia. "Hydrogen". Sandia. Retrieved 17 April 2012. ^ Puma, Steve (8 February 2010). "Hydrogen is Not The Miracle Fuel of the Future". Triplepundit.com. Archived from the original on 13 November 2012. Retrieved 21 August 2013. ^ "Van Hool A300L fuel cell (bus)". ^ a b "The Climate Group". The Climate Group. ^ Conservation Council of SA, 2 March 2006. "Rann's climate laws a first for Australia"
^ "States, utilities see investments in energy efficiency programs grow - Daily Energy Insider". Daily Energy Insider. 10 October 2018. Retrieved 23 October 2018.